carly tee: hopping with pretty pink posh! There are 4 $25 gift certificates up for grabs! Winners will be picked randomly along the blog hop (both days). Comments must be left by 11:59 PM PST on 11/7/2017 and winners will be announced on the PPP blog so make sure to leave a little "hello" along the hop to enter. Ok, back to the Wild Rose set...I used my MISTI to create a cascade of Wild Roses and then I stamped in different inks & played with an assortment of mediums. I stamped with my favorite black ink for watercoloring or pretty much anything, VersaFine. I colored just one flower with Clean Color Real Brush Markers and used a Nuvo Aqua Shimmer glitter gloss marker to blend. Finally I added a layer of Glossy Accents over the top for dimension and shine. It's hard to capture but the glossy glitter is so yummy! I stamped the flowers again using a Copic-friendly ink (I find it works better with the Nuvo Mousse). Then I coated the entire panel with Mother of Pearl Nuvo Mousse. It's like DIY shimmer paper with the stamped image underneath. I used the Clean Color markers to color the flowers, over the mousse, blending with just a little water. The final touches were sequins of course, and Nuvo Glitter Drops flower centers and smudged on the panel too. On this card, the flowers are stamped in Distress Oxide. Then I used more Distress Oxide to watercolor in a messy, Carly fashion. And I used one of the tiny, cute sentiments from the PPP Bear Hugs set. P.S. 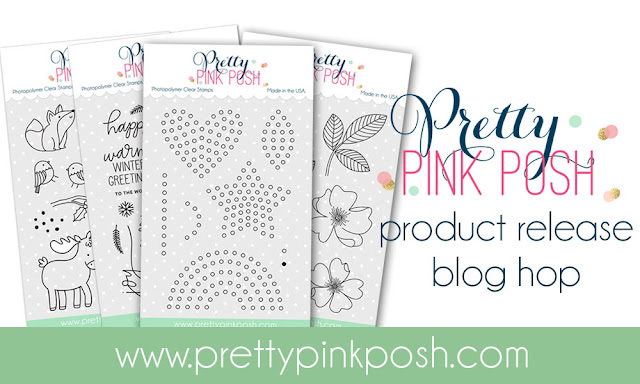 here are links to the dorable stamp sets from Pretty Pink Posh that I recommend you getting ASAP! Cute cards. Love the shimmer. Beautiful cards with those lovely techniques and coloring! I love all your cards. I’m most interested in the technique using the pearl mousse and coloring on top. I have never tried that and I might have to. I love the shimmer of the mousse. TFS. Beautiful cards ! The one with the mousse is really incredible, I really love it. Thank you for sharing. Love the colors you chose for the flowers. Beautiful! Great techniques! My fave is the oxide ink watercolor! Thanks for the multiple techniques on one stamp set. I will be trying out your mousse technique for sure. Love your cards and this post is so helpful, thank you for taking the time to post steps and screenshots! I am also becoming obsessed with the wild rose stamp. Beautiful work! Beautiful examples with how different techniques and mediums can give different results. Both are gorgeous! Nuvo mousse and distress inks. These colors are so great. I love how you show a non-traditional way to use these supplies from pretty pink posh! I love all the 3 looks with these flowers. Very pretty. These are very lovely cards, I need to try the mousse. Cool way to post your projects! Great cards, need to try the Nuvo Mousse! Lovely cards! I love the use of the different mediums. Fabulous! Beautiful. Love the different backgrounds and styles. What a happy and very pretty card!!! I like the variety of cards you created with this set. Pretty cards with different techniques!! Thank you for sharing! I can't decide which I love more. But there's something about the shimmer with the nuvo mousse that is stunning. TFS! Love your falling petals. Thats for showing us 3 ways. Love the shimmer of the nuvo mousse. Absolutely beautiful cards and thanks for explaining your techniques!! Thanks for illustrating technique an oxide! Lovely card! Wow !! This is a gorgeous set of cards ! Fantastic shading on the flowers. I LOVE these fresh, bright, cheerful colors! This is SO pretty! Love your wild roses and the added pink background! So lovely!! Very pretty shimmer on these cards. Beautiful cards! Love this stamp set. Wow! Stunning cards!!! Colouring is simply amazing!!! All three of your cards are very beautiful! I knew you could add Nuvo Mousse around stamped images with masks, but I didn't know you could color right over it! Thanks for sharing that tip! Love all 3! Different techniques, but great results! love the 3 different techniques for these cards. i love this wild rose set. This is such a lovely card! The combo of pink and yellow is so pretty, Thanks for sharing so many great tips and techniques! Beautiful card. Your coloring is fabulous. Lovely cards with the Wild Rose set! I love, love, love, love and did I mention I love your card? LOL Guess why? Your card has my favorite color in the whole wide world and a color that not enough people except me use very often, yellow! Today I have yellow corduroy pants on. Wow, that is such a beautiful stamp set! I love your Zig markers. I don't have any of those yet. I love glitter or anything with glitter but for some reason when I scan a card that has glitter on it, ir never seems to show up, so I get what you mean. The cards always look better in person is what I tell everyone and I see you sort of said that too. The glitter that I can see looks very pretty. I've never heard of Nuvo Mousse before. How do you use it, with your fingers or a Q-Tip? I may have to ask Santa for some for Christmas. Thank you for showing us your beautiful card and making me drool over all your yellow. Thanks also for giving us the chance to win something. So pretty! I like them all, but especially the Distress Oxide one, where you watercolor in a messy "Carly fashion"!! Lol. That made me laugh and smile...so funny! You are truly a great artist. Love your work! What a beautiful beautiful card!!! Love the soft background!! Beautiful coloring. You have talent there girl!! Your colors for the wild rose is beautiful. Nicely done. Such beautiful cards using just the one flower. Great techniques - thanks for sharing.